President Ramnath Kovind on Thursday described the current government as one that had worked to build a “New India” after assuming power in 2014 when, he said, the country was passing through “uncertain times.” The President was addressing a joint sitting of Parliament before the last budget session of the government. The address also gave a thumbs-up to contentious decisions of the government including demonetisation and the Rafale deal, which Mr. Kovind described as a move that would strengthen the strike capability of the Indian Air Force after a gap of many decades. The government believes that neglecting the country’s defence needs even for a moment is detrimental to the present as well as future of the country, he said. “Prior to the 2014 general election, the country was passing through a phase of uncertainty. After the elections, my government assumed charge and vowed to build a New India. A New India with no place for imperfect, corrupt and inertia-ridden systems,” President Kovind said. The President also referred to the Constitutional Amendment recently passed by Parliament enabling 10% reservation in jobs for the economically weaker sections in the general category, the triple talaq legislation and the controversial Citizenship Amendment Bill in the speech that lasted over an hour. Touching on the triple talaq Bill, which has been stuck in Rajya Sabha after being passed in Lok Sabha, Mr Kovind said the BJP-led NDA government was striving hard to get it passed by Parliament to “liberate Muslim daughters” from a life of fear and anxiety, and to provide them with equal rights. Highlighting the government’s achievements and various welfare schemes, President Kovind said 21 crore poor people were covered under the PM’s life insurance scheme, while over two crore households had got power connections as part of the Saubhagya scheme. “Under the Swachh Bharat initiative, the government has built nine crore toilets,” he said. He also described 2019 as a significant year for democracy as the country is observing the 150th birth anniversary of Mahatma Gandhi. “Be it cities or villages, the government has worked towards strengthening the health care infrastructure by building new AIIMS and wellness centres across the country,” the President said. Citing other achievements of the government, President Kovind said the number of people filing income tax returns had doubled from 3.8 crore to 6.8 crore under its tenure and added that over 73% of around 15 crore Mudra loan beneficiaries were women. Approvals for works costing over ₹66,000 crore out of the ₹80,000 crore package had been given by the government for development in Jammu and Kashmir, he said, asserting that the government was committed to the border State’s growth. In its response to Pune-based activist Vihar Durve who had sought the report from CAG, the country’s auditor said, “The audit is under progress and the report is yet to be finalised. The information cannot be given under Section 8(1)(C) of the RTI Act as the disclosure would cause breach of Parliament”. In December 2018, the Supreme Court had dismissed pleas challenging the deal between India and France for procurement of 36 Rafale jets, saying there was no occasion to “really doubt the decision making process” warranting setting aside of the contract. It rejected the pleas seeking lodging of an FIR and a court-monitored probe alleging irregularities in the ₹58,000 crore deal, in which both the countries have entered into an inter-governmental agreement (IGA). “The pricing details have, however, been shared with the Comptroller and Auditor General (CAG), and the report of the CAG has been examined by the Public Accounts Committee (PAC). Only a redacted portion of the report was placed before the Parliament and is in public domain,” the bench led by Chief Justice of India Ranjan Gogoi had said, relying on the sealed note submitted by the government. After the Congress raised the issue that no such CAG report had been placed before the PAC, the government approached the court seeking changes in the judgement. The Centre made it clear that it did not say that the CAG report was examined by PAC or a redacted portion was placed before Parliament. It clarified that the note had said the government “has already shared” the price details with the CAG, which was written in past tense and “is factually correct”. However, where it was stated by the Centre in the note that the report of the CAG “is” examined by the PAC, was a description of the procedure which is followed in the normal course, but in the judgement, ‘is’ was replaced with the words ‘has been’, according to the application. In its response to the RTI application filed by Mr. Durve, the CAG also refused to share its correspondence related to the audit of Rafale deal with any government department or political party, claiming that such records were “confidential and held in fiduciary capacity” hence, exempted from disclosure under the RTI Act. Parliament on January 09, 2019 cleared the Constitutional Amendment Bill guaranteeing 10% quota in education and employment to economically weaker sections in the general category, following an approval by the Rajya Sabha. 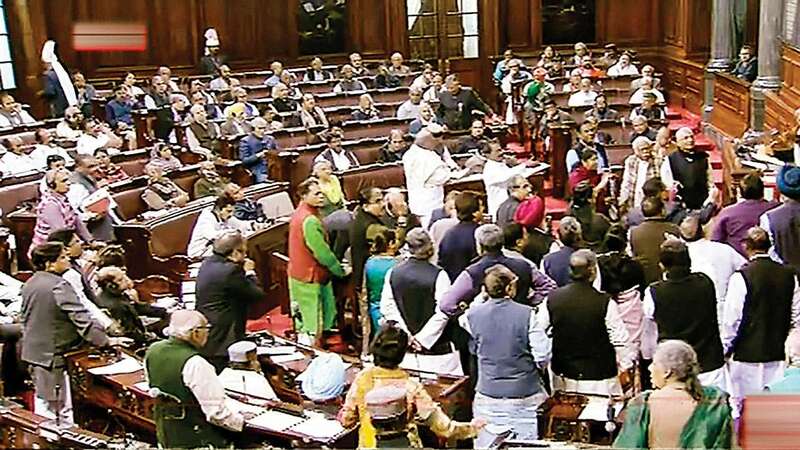 The Upper House nod came following an over nine-hour-long heated debate, during which the Opposition accused the government of bringing the Bill in haste with an eye on the coming Lok Sabha election. The AIADMK staged a walkout vehemently opposing the move, while some other political parties, including the DMK, the Left and the AAP demanded that the Bill be sent to a Select Committee. DMK’s Kanimozhi, supported by several members, sought a division of vote on her motion for referring the Bill to a Select Committee. However, it was defeated with just 18 votes in favour. Then the CPI and the AAP members walked out in protest. The Bill was passed with a majority of 165 against seven votes. It will be now sent for Presidential assent. The Constitution (124th Amendment) Bill was introduced by Minister of Social Justice and Empowerment Thawar Chand Gehlot, who later in his reply said that the existing reservation to the SCs, STs and OBCs would not be touched by the amendment. Clarifying the Bill’s provisions, Law Minister Ravi Shankar Prasad said the reservation would be applicable to jobs in both Central and State governments, adding that the legislation gave powers to States to determine the economic criteria for identification of beneficiaries. He responded to the Opposition’s charge of political intent by terming the government move a “slog-over six”, with many more to come. Earlier, during the debate, Congress leader Anand Sharma said provisions under Articles 15 and 16 of the Constitution were for the backward and weaker communities. In the past, attempts were made twice to extend reservation beyond their scope, but the Supreme Court struck them down. The same happened in several States. Stating that it took the BJP-led government over four years to bring the Bill in the last session, Mr. Sharma questioned the circumstances and the manner in which it was taken up — pointing out that the party had lost recent Assembly polls in five States. Also questioning the economic criteria set for extending the quota, he said not many people would benefit from it especially when the government had failed to create enough jobs. Mr. Sharma also asked the government to extend parliamentary session further to bring in the Women’s Reservation Bill for passage. Member Kapil Sibbal listed three hurdles that the law would have to surpass. There was complete non-applicability of mind on the government’s part, its constitutionality could come under judicial scrutiny and that the implementation part was not clear, he said. Samajwadi Party’s Ram Gopal Yadav demanded 54% quota for OBCs, as the government had now opened up the doors by breaching the 50% cap fixed by the Supreme Court. Although he supported the Bill, he said the Centre had failed to even provide proper reservation to the SC, ST and OBCs. “When there are no jobs, what is the meaning of reservation?,” he said. Derek O’Brien of the TMC accused the government of cheating the poor and the youth. “The Trinamool Congress is disgusted. We are angry that Parliament has been disrespected, completely disrespected and this is the wrong method which has been used here,” he said, stating that it was a political move by the government in the face of a projected poor performance in the coming Lok Sabha elections. Referring to various government schemes, the TMC leader said they were all “Cheat India” and the proposed law was yet another attempt to mislead people. Stating that the Bill had been brought without any empirical basis, AIADMK’s Navaneethakrishnan quoted a Supreme Court order, stating: “A Backward Class cannot be determined only and exclusively with reference to economic criterion. It may be a consideration or basis along with and in addition to social backwardness but it can never be the sole criterion”. He said the Bill trampled upon the rights of people in Tamil Nadu, which already had 69% reservation. Mr. D. Raja also questioned the haste with which the Bill was brought in. He said it was signed on January 7, introduced and passed by Lok Sabha on January 8 and then taken up in Rajya Sabha. He dared the government to bring reservation in the private sector. BSP’s Satish Chandra Misra said the Bill came after the meeting of his party supremo and Samajwadi Party chief for a possible pre-poll alliance in Uttar Pradesh. About 40 members of various parties participated in the debate, which culminated in the Bill being passed within 48 hours of being introduced in the Lok Sabha. The Prime Minister Shri Narendra Modi has lauded the passage of the Constitution (One Hundred and Twenty-Fourth Amendment) Bill, 2019 in the Lok Sabha on 08 January, 2019.“The passage of The Constitution (One Hundred And Twenty-Fourth Amendment) Bill, 2019 in the Lok Sabha is a landmark moment in our nation’s history. It sets into motion the process to achieve an effective measure that ensures justice for all sections of society”, the Prime Minister said. The Prime Minister Shri Narendra Modi has lauded the passage of the Constitution (One Hundred and Twenty-Fourth Amendment) Bill, 2019 in the Rajya Sabha on 09 January, 2019. “Delighted the Rajya Sabha has passed the Constitution (One Hundred And Twenty-Fourth Amendment) Bill, 2019. Glad to see such widespread support for the Bill. The House also witnessed a vibrant debate, where several members expressed their insightful opinions. Passage of The Constitution (One Hundred And Twenty-Fourth Amendment) Bill, 2019 in both Houses of Parliament is a victory for social justice.It ensures a wider canvas for our Yuva Shakti to showcase their prowess and contribute towards India’s transformation. By passing The Constitution (One Hundred And Twenty-Fourth Amendment) Bill, 2019, we pay tributes to the makers of our Constitution and the great freedom fighters, who envisioned an India that is strong and inclusive”, the Prime Minister said. A series of major reforms undertaken over the past year will allow real GDP growth to reach 6.75 percent this fiscal and will rise to 7.0 to 7.5 percent in 2018-19, thereby re-instating India as the world’s fastest growing major economy. This was stated in the Economic Survey 2017-18 tabled in Parliament today by the Union Minister for Finance and Corporate Affairs, Shri Arun Jaitley. It said that the reform measures undertaken in 2017-18 can be strengthened further in 2018-19. The Insolvency and Bankruptcy Board of India (IBBI) has amended (i) the Insolvency and Bankruptcy Board of India (Insolvency Resolution Process for Corporate Persons) Regulations, 2016, and (ii) the Insolvency and Bankruptcy Board of India (Fast Track Insolvency Resolution Process for Corporate Persons) Regulations, 2017 on 31stDecember, 2017. According to the Regulations, a Resolution Plan needs to identify specific sources of funds to be used for paying the liquidation value due to dissenting creditors. For this purpose, the ‘Dissenting Financial Creditor’, according to amended Regulations, means a financial creditor who voted against the Resolution Plan or abstained from voting for the Resolution Plan, approved by the Committee of Creditors. As per the Amendments, it is not necessary to disclose ‘liquidation value’ in the Information Memorandum. After the receipt of Resolution Plan(s) in accordance with the Insolvency and Bankruptcy Code, 2016 (Code) and the Regulations, the Resolution Professional shall provide the liquidation value to every member of the Committee of Creditors after obtaining an undertaking from the member to the effect that such member shall maintain confidentiality of the liquidation value and shall not use such value to cause an undue gain or undue loss to itself or any other person. Also, the Interim Resolution Professional or the Resolution Professional, as the case may be, shall maintain confidentiality of the liquidation value. According to the Amendments, a Resolution Applicant shall submit the resolution plan(s) to the resolution professional within the time given in the invitation for the Resolution Plans in accordance with the provisions of the Code. This will enable the Committee of Creditors to close a resolution process as early as possible subject to provisions in the Code and the Regulations. The Amendments have come into force from today on their publication in the Gazette of India. The Amendments are available at www.mca.gov.in and www.ibbi.gov.in. The Union Cabinet on Monday cleared four supporting GST legislations, paving the way for their introduction in Parliament as early as today. The four supporting legislations — the Compensation Law, the Central-GST (C-GST), Integrated-GST (I-GST) and Union Territory-GST (UT-GST) — would be introduced as Money Bill, sources said. “The GST legislations have been cleared by the Cabinet. These would be introduced in Parliament this week, could be even today,” a source said. The GST legislations were the only agenda in today’s meeting of the Union Cabinet, chaired by Prime Minister Narendra Modi. While the C-GST will give powers to the Centre to levy GST on goods and services after Union levies like excise and service tax are subsumed, the I—GST is to be levied on inter-state supplies. Prime Minister Narendra Modi on Tuesday addressed the Lok Sabha and participated in the discussion on the Motion of Thanks on the President’s joint address toParliament during the Budget session. Modi also took a dig at Rahul Gandhi’s infamous ‘earthquake’ remark while taking a sly swipe at Gandhi’s retort on his SCAM barb. He defended his government’s decision to ban high-value currency notes, saying it was the right step taken at the right time to rid the Indian economy of tax evasion and black money. He also condoled the death of Subhas Chandra Bose’s close associate and INA veteran Colonel Nizamuddin, who died at the age of 116 on Monday. – PM Modi speaks on surgical strikes in Lok Sabha, lauds Indian Army. – Crop insurance was in existence earlier also, but farmers didn’t want to avail it; It didn’t secure the rights of farmers: PM Modi. – Why was it that there were crop insurance schemes earlier but farmers were not keen to avail of the benefits: PM . – India is an agricultural country. Generally, we start disbursement of budget in May and Monsoon start in June. So for three months we were not able to use the budget allocation: PM Modi speaks on early Budget. – Desh mein ek aisa varg panpaa jo gareebo ke haq ko loot-ta raha, isiliye desh unchaaiyon par nahi pahunch paya: PM Modi. – I had said it from the Red Fort. Every Prime Minister has contributed to the nation: PM Modi in the Lok Sabha. On the eight day of demonetisation, MPs and other political leaders today had plenty to say about the biggest financial decision of the year. Here’s a round-up of the top quotes from the day. We are prepared to discuss all issues the parties want to discuss. This will be an open debate as the deliberations have been open. There has been a drastic decrease in naxalism and terrorism across the country due to demonetisation. No Indian is questioning the intention of the PM. The entire country is praising Modiji’s bold move. The move (demonetisation) was implemented without any planning. This has created financial calamity and financial emergency in the country. The country has been pushed towards anarchy. The government should restore normalcy. More often than not, the Prime Minister speaks and we all listen. He speaks on television, on radio through the media. But the same media is not available to us. There is no way we can communicate with the Prime Minister. We demand that PM should be present here tomorrow morning and participate in the discussion on demonetisation. There is no politics in it (demonetisation). It is a step taken in national interest. If anyone has the strength to take on black money and corruption, it is the BJP government and Narendra Modi. Desh me imandaar ka samman hua hai aur be-imaan ka nuksaan hua hai, (The honest have been honoured and the dishonest have faced losses). The government has said that they spent ten months preparing for this decision. Ten months was a long time to prepare. If they were serious about it, they would have prepared well for all the problems that people are facing today. Those who are real black marketeers, those who have Rs 10-20,000 crore, those who go with (Prime Minister) Modi in planes, action should be taken against them. No action is being taken. It (demonetisation) reminds me of Marie Antoinette who during the French Revolution said if they (the people) don’t find bread, why don’t they eat cakes. Now, we have Modi Antoinette who says: ‘If you don’t have paper, use plastic.’ What is the coverage of your plastic money? People’s ‘white money’ is being looted and you talk of checking ‘black money?’…Those who are hailing demonetisation will face reality in 4 months when (the) cash crunch hits them. No commodity will sell, including Baba Ramdev’s products. An atmosphere has been created where questioning the government has become the parameter to decide one’s nationalism…The government has (a) list of those holding black money in Swiss bank(s). We demand that (the) PM…tell who all are there in the list. Reveal names of people whose loans you have waived off.